Cambridge, MA-based start-up Swoop is launching a new service that lets Web publishers and advertisers show relevant local offers to consumers at the right time. Formerly Shopximity, Swoop is kicking off the service with a focus on local food offers. For example, if someone is browsing a recipe that calls for butter, Swoop would show an alert about a sale on butter at local stores or a manufacturer coupon for a discount. 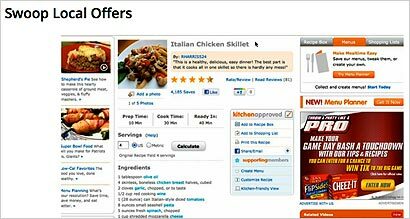 A user could then click on a link to open a window that shows all the local deals or other related information. People can even use the system to create shopping lists and specify stores they’re interested in by Zip code. At present, all the information on deals comes from weekly circulars published by local supermarkets or other food stores. How does Swoop know what offers to present, and when? Essentially, its software uses natural language processing and semantic technology to understand what the user is reading at a micro level and then combines that with search terms or the general context of an article, plus any information a user has provided, like a Zip code. “Fundamentally it is a technology that brings the power of online search and discovery to Web content,” said Swoop founder and CEO Ron Elwell. The company plans to expand the service beyond food to other industry verticals over time. Kristine Welker, chief revenue officer at Hearst, stated an interest in "how Swoop can integrate with our existing content." For now, the company isn’t charging publishers or advertisers to use the Swoop technology. But Elwell says Swoop plans to charge advertisers on a per-engagement basis. For a brand like Smart Balance, it might show the recipe browser a message asking if they’re interested in a “heart-healthy alternative” to butter as an ingredient. If the user clicks on the link, it will open a larger landing page with information on the brand’s spread and why it’s better for you. "In the end it is very much like search -- the user chooses to engage with the sponsored content, and that’s when we get paid," said Elwell. Until the revenue begins flowing, Swoop has $4.8 million in venture funding that it raised last year from investors, including US Venture Partners and General Catalyst, to help finance operations.